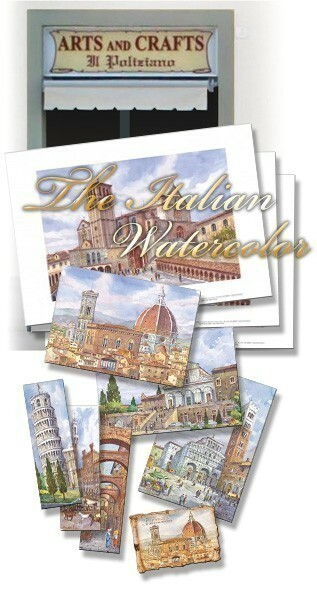 The Italian Watercolor is a fantastic collection of postcards, bookmarks and posters, which faithfully reproduce original watercolors through a photoligraphic process. The authors of the remarkable original works are well-known Italian painters, among them the famous watercolorist Giovanni Ospitali. The images in these works represent: beautiful landscapes, famous streets and architectural monuments from some of the most beautiful Italian cities. The collection also contains trypical farmsteads from the countryside and wonderful scenes of rural life. You can also find reproductions from the original drawings in charcoal by Master Antonio Ciccone whose work pays omage to great artists such as Michelangelo, Botticelli, Giambologna, B. Cellini, A. Vanni. The content of this site is the result of the innovative thinking of Enrico Pratesi who, in the early nineties began to realize the collection and, expanding and perfecting the production over the period of 25 years, gave birth to one of the most distinguished postcard collections in existence. To see the postcards collection, click on postcard collection.